Helplessly virtuous? I don’t think so. My Grandma used to tell us a silly joke using a napkin. She would pinch the napkin together and hold it under her nose like a mustache saying, “You must pay the rent!” with a forceful voice. The napkin would then be moved to her hair like a bow and a little lady voice would say, “But I can’t pay the rent!” This would be repeated two or three times until the napkin would be placed at her throat like a bow tie and a heroic voice would declare, “I’ll pay the rent!”. At which point the napkin would go back to the hair and the lovely lady would sigh, “My hero!”. In many ways, this little joke could be considered a microcosm of the expectations of romance readers. Do you recall the days when it was unseemly behavior to take a walk with a gentleman without a chaperon? Do you remember your mother warning you not to let anyone take liberties with your person? Did she admonish you to wear a hat and gloves at all times? Perhaps you were the cause of a scandal in your social circle because your dress was too short to cover your ankles and the sight of them might drive a man mad with desire. Did your mother advise you as to the proper place of a woman and teach you the accepted womanly virtues? How many summer days did you spend inside learning to paint, embroider, and play the piano or sing? The reality is that very few of us, if any, spent our days studying what are considered gentle, feminine tasks. Romance authors today seem to have realized that in order for modern audiences to identify with their heroines, they need to create women who are different or rebellious for their time period. After all, who can sympathize with a simpering nitwit who sits helplessly in a corner weeping while she waits for a man to notice her? Today’s readers are dissatisfied with characters who refuse to be assertive on their own behalf. When it comes to romance, an author must follow a fine line that allows the hero to be a hero and the woman to be a lady. They can’t be too good…and they can’t be too bad. Samuel Richardson was one of the first authors to write about the trials of love. 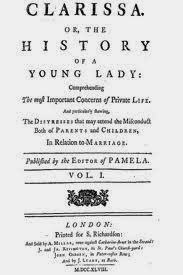 Pamela (or Virtue Rewarded), first published in 1740, is an epistolary novel which means that events are revealed mainly through the use of letters. Pamela is a lovely, innocent young housemaid. Her employer passes away which leaves her unprotected and alone. 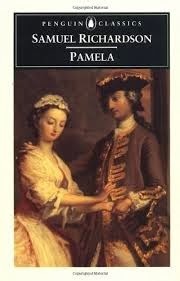 Her employer’s son, begins a campaign to seduce Pamela (who is only 15) and make her his mistress. No one will intercede on her behalf due to her lowly origins and her employer’s social standing. When things finally come to a climax and Mr. B realizes that his behavior is hurting her, he decides to let her go. However, a few notes and letters later, Pamela realizes that she is in love with Mr. B (which he has also conveniently realized). A few letters later, Pamela has learned her role as wife and Mr. B’s family has come to accept her. Richardson’s second novel, Clarissa, ends tragically. Though it is filled with intrigue, dueling, kidnapping, danger and romance, it is another hefty epistolary novel. Unlike Pamela, Clarissa is a bit more bold and daring as a heroine as she is brave enough to escape her tormentor. Unlike Pamela, although she has escaped, her virtue is rewarded by dying of an illness caused by the mental distress of being pursued relentlessly. (Yes, she was so stressed out that a guy she didn’t like wouldn’t leave her alone, she sickened and died.) To our modern minds, that is probably the point at which the story becomes a farce. 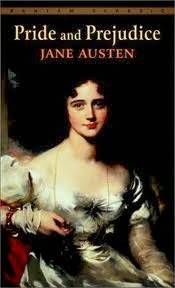 Jane Austen is the author who has set the standard of modern romance. The majority of romances today tend to follow a plot line that is similar to Pride andPrejudice. If an author neglects to create a conflict between the attracted parties; if all goes well from the first time their eyes meet across a crowded room, the book is not believable. If the reader cannot become invested into the positive outcome of the relationship, they’ll put down the book. Romance readers may pick up a book to escape into something that they know isn’t real but they still expect the story to be authentic. They know that most of the men walking down the street are not dukes, spies, billionaires or Navy SEALs, but they still want to pretend that those men might be out there. And what is wrong with enjoying a relaxing romantic interlude with one of these guys for just a few short hours?